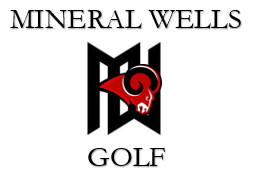 The Mineral Wells High School golf team's primary concern is to have the boys and girls on the team learn the skills involved in playing golf, which they can enjoy for the rest of their life. Experience is not a necessity in joining the team. The basics of golf are reintroduced every year. Time at practice is spent on the basic grip, stance, and swing. Specific areas are covered including putting, chipping, sand shots, and course management. All team members get to use the driving range, putting green, chipping green and play the course at Holiday Hills Country Club during practice time. The team competes in the District 6-4A tournament each season in stroke play competition which is in early April. Varsity boys and girls will compete in 4 invitational tournaments in the fall and 4 invitational tournaments in the spring. Our goal is to have our players improve their game, enjoy themselves and the company of their teammates, and to play to their potential in their rounds.